1 hour charger for 7.2V to 18V DEWALT battery packs (except Univolt®). 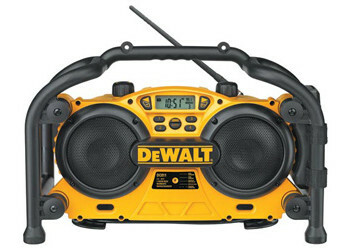 Heavy-duty AM/FM radio with auxiliary port allows user to listen to the radio or CD (when plugged into auxiliary port). Runs off of 7.6V to 18V DEWALT batteries making it a cordless radio. Digital Tuner with LCD display, built-in clock, and 8 station memory presets. High efficiency weather resistant speakers with dual bass ports for maximum bass and range. Dual pivoting 11" flexible antenna provides more durability and better reception. Weather sealed charger door opens easily for fast battery changes. The DEWALT 3 - stage charging system provides maximum run-time and extends overall life of the battery. Heavy-Duty storage case allows storage for CD player and CDs.